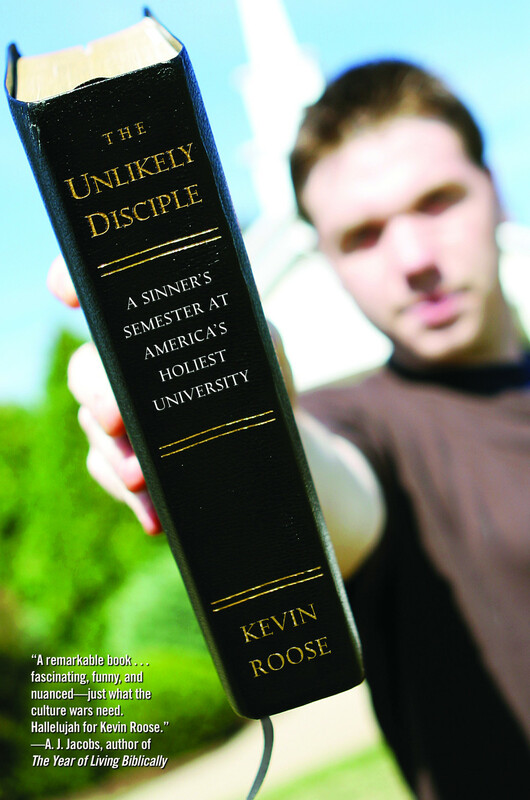 The Unlikely Disciple: A Sinner's Semester at America's Holiest University is my first book, published in 2009. It's about the semester I spent undercover at Liberty University, the late Rev. Jerry Falwell’s “Bible Boot Camp” for young evangelical Christians. I grew up in the ultimate secular/liberal family (my parents are Quakers who used to work for Ralph Nader), and I never attended church as a kid. But during my sophomore year at Brown University, I got the idea to enroll at Liberty as a transfer student, hoping to learn about my right-wing Christian peers by living among them for a semester while pretending to be one of them. The Unlikely Disciple is the story of that semester. I sang in Jerry Falwell's church choir, took classes in Creationism and Evangelism 101, lived on a hall with sixty Christian guys, went on a spring break trip to Daytona Beach to convert lost souls, and learned some unexpected lessons. Here's some praise the book got from reviewers:. "A great book ... The portrait he paints of the place is nuanced and fascinating." “The Unlikely Disciple is by turns appealing and appalling, laugh-out-loud funny and sobering, serious and silly — just like a semester at college. Kevin Roose has produced a book that is fair, empathetic, thoughtful, touching, consistently entertaining, and a harbinger of more good writing to come."